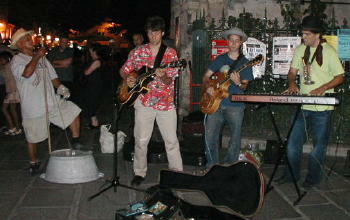 Every year, it seems, we stumble onto the street corner where these American jazz musicians are playing. The mainstay, the older black man who looks like Red Skelton, is accompanied by three younger guys. The two on the right were with him last year. The guitarist in the red floral shirt is new this year. These guys are great. This year we found them on the corner of Blvd Saint Germain, right next to the church by the same name. Tom and I slipped back into the shadows in front of the church and danced a nice, long, slow dance to the music they made. Condom vending machine on Avenue Rapp, near the Champ de Mars. The world is full of danger. I just sent a copy of an article about the previously mentioned alligators we live with to a new friend we met last Thursday in Paris. Another person has been killed by an alligator on Sanibel. That makes two people killed by these creatures on our fair island since 1973. This time, there was no evidence that the alligator had been fed. He was huge -- over 11 feet long. And here, the Eiffel Tower was evacuated twice in the span of four days. First time was for a false bomb scare. The second was when a former employee (a high altitude painter) climbed to some place between the second and third observation levels and was planning to jump -- to commit suicide -- because of family problems. He got up there at 7pm three days ago, waving some kind of illegal weapon around, and the police and firemen ordered the tower to be evacuated. Then they got a psychiatrist who spent three hours talking the man out of his suicide attempt. Tom and I happened to walk by there on the way to dinner at about 7:30. We saw that the area was evacuated, and that there were fire trucks under the tower with lights flashing. This one is for my old friend Tom Langevin, who once wrote a history of Battelle. 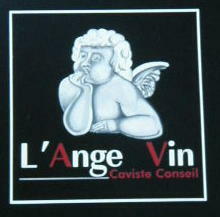 This is a good name for a wine store, located on Avenue Rapp. 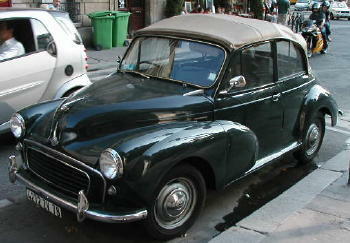 A Morris Minor parked near Avenue Rapp.